About | McCoy Machinery Company, Inc.
McCoy has been a leader in design and manufacturing of warp preparation equipment for over 50 years. Founded in 1964 by Dan W. McCoy Sr., McCoy has been on the forefront of machine development, performance, and manufacturing for decades. 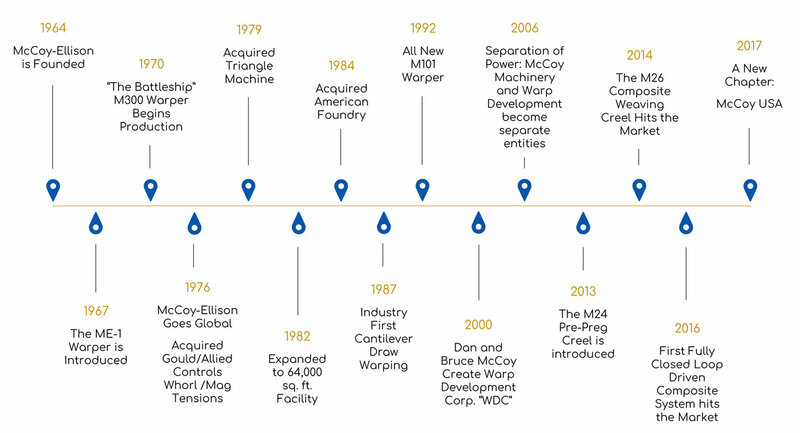 McCoy has long been the leader in high speed, technical warping and warp preparation equipment. We have a seasoned and knowledgeable staff that spans over 40 years. This experience and depth of knowledge is the key to our continued success, as we’re the only domestic warp preparation machinery company left standing, and we’re proud of that fact. 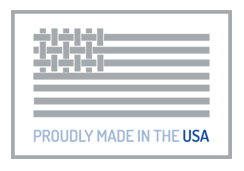 Over the last 4 years and under new leadership, McCoy has embarked on a new journey to share our expertise in fiber handling and tension control with the Composites Industry. McCoy has fresh new designs for creels and material handling systems that are widely accepted and popular in the weaving, coating, pulltrusion, pre-preg, and driven unwind/rewind market segments. Again, we’re the only domestic company that offers these unrolling creels on a commercial basis, and they’re all Made in The USA. McCoy is poised to be a market leader in the composites market and continues to develop and design new Fiber Delivery Systems across most markets and applications. We proudly wear our Proudly Made in America mantra on our sleeves and in our hearts, because at McCoy, it’s not a slogan, it’s our way of life. We do everything in our power to build, design, and procure right here in the Monroe, NC area with US suppliers and local support partners. 98% of our manufactured parts and components are Made in the USA, and we’re working hard every day to get that number to 100%. From technical service to the largest warping spare parts inventory in the nation, McCoy continues to service and support our customers and machinery, on every level. Today, thanks to our industry partners, McCoy is still sourcing nearly 100% of its components and machined parts locally and domestically. McCoy is the only domestic company that offers unrolling creels on a commercial basis, with all parts Made in The USA. We are poised to be a market leader in the composites market as we continure to develop and design new Fiber Delivery Systems across most markets and applications.